Cyrus the Great (ca.600 - 529 BCE) was a towering figure in the history of mankind. As the "father of the Iranian nation", he was the first world leader to be referred to as "The Great". Cyrus founded the first world empire - and the second Iranian dynastic empire (the Achaemenids) - after defeating the Median dynasty and uniting the Medes with the other major Iranian tribe, the Persians. The name "Cyrus" (a transliteration of the Greek Kυρoς) is the Greek version of the Old-Persian kûruš or Khûrvaš meaning "sun-like": the noun khûr denotes "sun" and -vaš is a suffix of likeness. In the Cyrus cylinder (see below), the great king declares his ancestry as a Persian king. 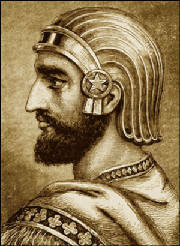 The first leader of the Achaemenid dynasty was king Achaemenes of Anshan (ca.700BCE). 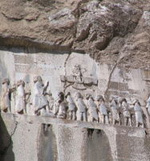 He was succeeded by his son Teispes of Anshan and inscriptions indicate that when the latter died, two of his sons shared the throne: Cyrus I of Anshan and Ariaramnes of Persia. They were succeeded by their respective sons: Cambyses I and Arsames. 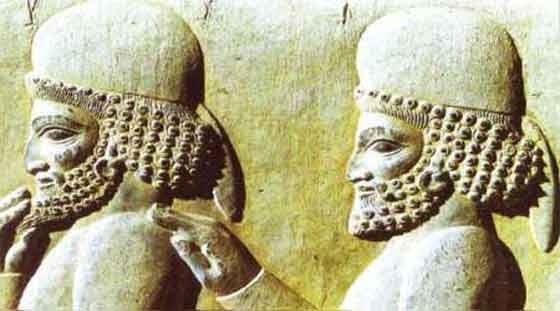 Arsames was the ancestor of Darius the Great, while Cambyses was the father of Cyrus the Great. Mandane, Cyrus' mother, was the daughter of king Astyages, who was the last emperor of the Median dynastic empire (728-550BCE). Cyrus became king of Anshan after his father's death in 559BCE, and initially reigned as Median vassal king of the Persian tribes. He established his residence at Pasargadae in Pars province, the centre of the Pasargadae tribe, to which the Achaemenid clan belonged. Little is known of Cyrus' early life as the few known sources have been damaged or lost. According to the ancient historians, Astyages was told in a dream that his grandson, the baby Cyrus, would overthrow him. To avoid this he ordered that the baby be killed. However the official delegated with the task gave the baby to a shepherd instead. When Cyrus was ten years old, the deception was discovered by Astyages, but because of the boy's outstanding qualities he was allowed to live in exile with his mother. Cyrus then revolted against Astyages in 554BCE and in 550BCE the prophecy came true when Cyrus entered Ecbatana (modern-day Hamadan), effectively conquering the Median Empire. Upon his victory over his grandfather he founded a government for his new kingdom, incorporating both Median and Persian nobles as civilian officials. He thus began to build the first world empire. As the founder of the Achaemenid Empire, one of Cyrus' objectives was to gain power over the Mediterranean coast and secure Asia Minor. Croesus of Lydia, Nabonidus of Babylonia and Amasis II of Egypt joined in alliance with Sparta to try and thwart Cyrus - but this was to no avail. Hyrcania, Parthia and Armenia were already part of the Median Kingdom. Cyrus moved further east to annex Drangiana, Arachosia, Margiana and Bactria to his territories. After crossing the Oxus, he reached the Jaxartes. There, he built fortified towns with the object of defending the farthest frontier of his kingdom against the Iranian nomadic tribes of Central Asia such as the Scythians. The exact limits of Cyrus' eastern conquests are not known, but it is possible that they extended as far as the Peshawar region in modern Pakistan. After his eastern victories, he repaired to the west and invaded Babylon. On 12 October 539BCE Cyrus, "without spilling a drop of blood", annexed the Chaldaean empire of Babylonia - and on October 29 he entered Babylon, arrested Nabonidus and assumed the title of "King of Babylon, King of Sumer and Akkad, King of the four corners of the world". Almost immediately he then extended his control over the Arabian peninsula and the Levant also quickly submitted to Persian rule. Although Cyrus did not conquer Egypt, by 535BCE all the lands up to the Egyptian borders had acceded to Persian dominance. Newly conquered territories had a measure of political independence, being ruled by satraps. These (usually local) governors took full responsibility for the administration, legislation and cultural activities of each province. According to Xenophon, Cyrus created the first postal system in the world, and this must have helped with intra-Empire communications. Babylon, Ecbatana, Pasargadae and Susa were used as Cyrus' command centres. Cyrus' spectacular conquests triggered the age of Empire Building, as carried out by his successors as well as by the later Greeks and Romans. Almost nothing is known about Cyrus' personal beliefs, but Xenophon reports to us that in religious matters he followed the guidance of the Magians at his court. Although this is not universally agreed, Mary Boyce has argued that Cyrus was indeed a Zoroastrian and that he thus followed in the footsteps of his ancestors, from when they were Median vassals in Anshan. She has pointed out that the fire altars and the mausoleum at Pasargadae demonstrate Zoroastrian practices, and has cited Greek texts as evidence that Zoroastrian priests held positions of authority at Cyrus' court. Cuneiform records from Babylon suggest that Cyrus died on 4 December 530BCE. However, according to Herodotus, Cyrus was killed near the Aral Sea in July or August 529BCE during a campaign to protect the north­eastern borders of his empire from incursions by the Massagetae. Tomyris, the queen of the Massagetae, had assumed control of her nation's forces after Cyrus had defeated and killed her son Spargapises. She led the attack on the Iranian forces, who suffered heavy casualties as well as losing their leader, Cyrus. After the battle, Tomyris apparently ordered the body of Cyrus to be found so that she could avenge the death of her son. She then dipped Cyrus' head in blood or by some accounts ordered his head to be put into a wine-skin filled with human blood. At Cyrus' death, his son Cambyses II succeeded him. He attacked the Massagetae to recover Cyrus's ravaged body, before burying it at Pasargadae. The Cyrus cylinder was discovered in 1878CE at the site of Babylon. It is inscribed in Akkadian cuneiform. Now housed in the British Museum, it includes a detailed account by Cyrus of his conquest of Babylon in 539BCE and his subsequent humane treatment of his conquered subjects. It has been hailed as the world's first declaration of human rights. The (incomplete) inscription on the cylinder starts by describing the criminal deeds of the Babylonian king Nabonidus; as well as how Marduk, the Babylonian god, had looked for a new king and chosen Cyrus. It continues with the famous: "I am Cyrus, king of the world, the great king, the powerful king, king of Babylon, king of Sumer and Akkad, king of the four quarters of the world" After a description of Cyrus' ancestry and of royal protocol, it goes on to explain how Cyrus established peace and abolished forced labour: "The people of Babylon . . . the shameful yoke was removed from them" The inscription continues by detailing reparative building activities in Babylon as well as asking for prayers for Cyrus. It makes specific reference to the Jews, who have been brought to Babylon - and who Cyrus supported in leaving for their homeland. Further demonstrating his religious tolerance, Cyrus restored the local cults by allowing the gods to return to their shrines. The cylinder describes the Great King not as a conqueror, but as a liberator and the legitimate successor to the crown of Mesopotamia. The same text has also been found, in a more complete version, in an inscription discovered in the ancient city of Ur, in Mesopotamia. Both documents corroborate many of the details in Ezra 1:1-5 describing Cyrus supporting the Jews in returning to Judea from captivity to rebuild the Temple in 537BCE. Isaiah 45:1-13 also backs up the idea of Cyrus as a benign and chosen ruler. Before the discovery of the cylinder, many sceptical historians believed that the idea of a Zoroastrian emperor like Cyrus the Great allowing a conquered people like the Jews to return to their homeland and rebuild their Temple was simply not credible and could only be Persian propaganda. Nevertheless, the Cyrus Cylinder, alongside the Biblical and other historical statements, seems to substantiate the idea that Cyrus not only allowed many of the nations he conquered to practice their various religious beliefs - an unprecedented tolerance - but that he even actively assisted captive peoples, including the Jews, to return to their lands of origin. This support was not only political but even financial - as he gave grants both from the Imperial treasury and also from his own personal fortune. The Cylinder has especial resonance for the Iranian peoples and is an integral part of Iran's cultural heritage and national identity. Antedating the 1789 French Declaration of the Rights of Man and the Citizen by more than two millennia, it can also be considered as a world treasure - and the first international declaration of human rights. The text was translated into all the United Nations' official languages in 1971. Cyrus the Great is famed as a triumphant conqueror, a superb warrior, and the founder of the greatest empire the world has ever seen. However, with the Cyrus Cylinder and a range of Jewish texts, plus extensive writings by Xenophon, Cyrus is generally more admired as a liberator than a conqueror. Cyrus the Great was mentioned twenty-two times in the Old Testament, where he is unconditionally praised. This followed his active liberation of the Jews from Babylon in 539BCE and his support as more than 40,000 Jews then chose to return to their homeland. Cyrus then funded the subsequent rebuilding of the Temple in Jerusalem. Cyrus was also eulogized by many other writers and his actual or legendary exploits were used as moral instruction or as a source of inspiration for political philosophies. For example, the Greek author and soldier Xenophon believed him to be the ideal ruler, and in the Cyropedia - often considered Xenophon's masterpiece - he offers a fictionalised biography of the great man. This is more "a treatise on political virtue and social organisation" than a history. It was influential in ancient times and then again in the Renaissance. It may have been composed in response to Plato's The Republic, and Plato's Laws seems to refer back to it. Scipio Africanus is said to have always carried a copy of the Cyropedia with him. Later on, in the Renaissance, Spenser, in his The Faerie Queene (1596), says: "For this cause is Xenophon preferred before Plato, for that the one, in the exquisite depth of his judgment, formed a Commune wealth, such as it should be; but the other in the person of Cyrus, and the Persians, fashioned a government, such as might best be: So much more profitable and gracious is doctrine by ensample, then by rule." The English philosopher Sir Thomas Browne named his 1658 discourse The Garden of Cyrus after the benevolent ruler. This dense treatise of hermetic philosophy may be a Royalist criticism upon the autocratic rule of Cromwell. Cyrus' name and his doctrine is still cited and celebrated into modern times. On 12th October 1971 Iran marked the 2500th anniversary of Cyrus' founding of the Persian Empire . The then Shah of Iran, in his speech opening the celebrations, said: "O Cyrus, great King, King of Kings, Achaemenian King, King of the land of Iran. I, the Shahanshah of Iran, offer thee salutations from myself and from my nation. Rest in peace, for we are awake, and we will always stay awake." In 1994, a replica of a bas relief depicting Cyrus the Great was erected in a park in Sydney, Australia . This monument is intended as a symbol for multiculturalism, and to express the coexistence and peaceful cohabitation of people from different cultures and backgrounds. By pursuing a policy of generosity, instead of repression, Cyrus demonstrated his Greatness. So successful were his policies of conquest, mercifulness and assimilation that the empire continued to thrive for some 200 years after his death. Cyrus' compassionate principles continue to resonate today: his religious and cultural tolerance and commitment to the liberation of enslaved peoples remain an aspiration in our troubled modern world.